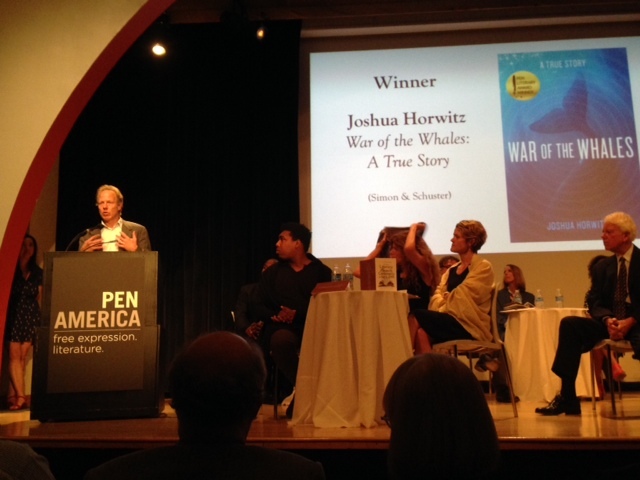 New York City, May 13, 2015—PEN American Center, the largest branch of the world’s leading literary and human rights organization, announced today the winners and runners-up of the 2015 PEN Literary Awards, the most comprehensive literary awards program in the country. Among the awards is the PEN/E.O. 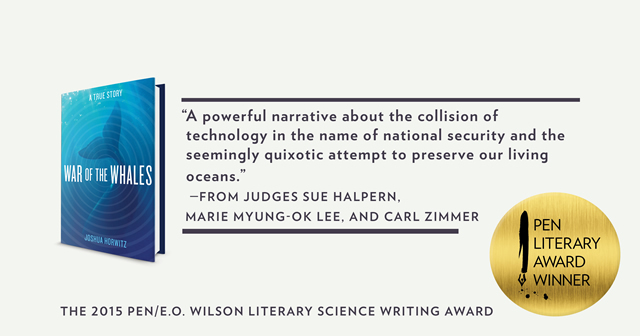 Wilson Literary Science Writing Award, which celebrates writing that exemplifies literary excellence on the subject of physical and biological sciences. The winner receives a cash award of $10,000 and will be honored at the PEN Literary Awards. Award winners and runners-up will be honored at the 2015 PEN Literary Awards Ceremony on June 8, 2015, at the New School. Read the full list of the 2015 PEN Literary Award winners on the PEN American Center’s website. “A Win For The Whales: Navy Agrees To Limit Sonar Use (Interview with Joshua Horowitz).” NPR’s All Things Considered. September 19, 2015. “I’m honored to receive this PEN/E.O. Wilson award. And I feel particularly proud to have my name linked to E.O. Wilson’s. Wilson has always been a hero of mine for being such a tireless champion of biodiversity. I’m especially indebted to him for coining the concept of “Biophilia,” which informs every chapter of my book. Biophilia, as Wilson describes it, is our affinity and love for all living creatures. Wilson’s genius lies in his recognition that this bond is more than a simple sentimental attraction to the charisma of animals. Biophilia is a hardwired, instinctual trait that carries a strong evolutionary advantage. We care deeply about nonhuman animals because we understand that we all have a shared stake in the survival of a biodiverse planet. With less biodiversity, our planet is less alive, and we are each less complete.